Luminous, spacious, architectural Venice home in fabulous neighborhood near beach and hippest shopping and dining street in LA. Character-filled 1905 Craftsman with dramatic light-filled 2005 contemporary addition Beautiful fully gated garden with two dining tables. Full laundry. Broadband wireless secure high-speed internet. Free N. A. long distance telephone. Two LCD TV's w/streaming video. 1 on-site and free street parking, Golf, biking, surfing, swimming, tennis, volleyball, fitness, hiking, sailing, boating, fishing, skating nearby. 15 walk to Venice Beach and continuing up to Santa Monica and Malibu beaches. Why you want it! : Home of Artist/Architect and Film Set Decorator. 2005 Contemporary Addition to 1905 Original Craftsman, full of art and mid- century furniture. Magical property with beautiful quiet outdoor garden space with seating and dining. Set in neighborhood of equally magical homes, gardens, street plantings and walk streets. Close to fabulous Abbott Kinney shops, restaurants, galleries and all services and 15 minute walk to Venice Beach. 2 bicycles included. Full cooking and laundry facilities. Gas and charcoal Barbecue. Two LCDTVs. Full media and entertainment facilities, including free streaming to TV Netflix movies.1 Car parking on site, free permitless on street parking. 10 minute drive to 405 and 10 Freeways and to magnificent Pacific Coast Highway along beach to Malibu and beyond. Why you'll want it again! : Amazing holiday/end of year weather, wonderful summer weather with cooling onshore beach breezes with no rain. You will fall in love with neighborhood.You will feel like you are home not away! Biking along beachside bikepath. Hiking and mountain biking in Santa Monica Mountains. Excellent inexpensive public golf course 5 minutes away, with more in area. Unique Venice Beach culture and historic Santa Monica Pier. Close proximity to world class Getty Center, Getty Villa, Hammer Museum and Skirball Center. Full amazing L.A. World just down the road. Full amazing California World just up and down and out the freeways. Get down on it! Master Bath has dual lavatory sinks and dual shower heads in large tiled Roman soaking Tub. Guest Bath has large wall-hung vanity, new Duravit soaker tub with dual shower heads, and has stacked washer/dryer in cabinet. The whole Downtown World of Los Angeles is a ride down the Santa Monica Freeway (times vary accordingly during the day). The whole Santa Monica Mountains extending from Topanga to The Angeles Crest Highway is close and available for hiking, and mtn bike and horseback riding. The Whole Pacific Ocean! Beaches, boardwalks,bikepath the whole length, cafes, clubs, Historic piers, and a whole lotta fabulous people out enjoying themselves. The sleepy beachtown of Venice Beach, but with the two-blocks away Abbott Kinney Blvd, called by me in this ad the hippest street in LA, but recently called 'The hippest street in America'. The LA River, now being reconsidered as a viable natural resource, and place of bike and hiking paths and historic murals. I rented this house for 2 of my directors coming from the UK to do a job in LA. They LOVED it. Great quiet space for them to work from. Plus, just a small walk to Abbot kinney for great shopping and restaurants. The house was immaculate when they arrived and the owner was available to answer any questions we had. This home exceeded our expectations... not only beautiful but perfectly located. This house has an open and airy feel with an abundance of natural sunlight. It is modern and very clean with a sophisticated and eclectic style. Such a great vibe to walk into. We are a family of 4 and comfortably stayed here for 3 weeks. It is well equipped with ample kitchen supplies, clean and comfortable linens and plush towels. The outdoor space is very private, it was a delightful place to relax and hang with our kids. Loved the neighborhood, it's charming and quiet but in the center of it all. We took advantage of the easy access to Abbot Kinney and enjoyed the many fine restaurants, coffee shops and shopping. The owner was personable and a pleasure to work with. He was very accessible and answered any questions promptly. Look forward to coming back! I stayed at the house for a couple of months and had a wonderful stay. The house is beautifully furnished and incredibly private. The entrance is off a walk street, 2 minutes walk from Abbott Kinney, and the outside garden area is great for morning and afternoon sun. I like to cook and the kitchen more than caters for that, with everything one needs. The hosts are a lovely couple and communication was seamless and easy. I thoroughly recommend staying here if you're looking for the ultimate in Venice living. My husband and I and our two almost grown daughters stayed in this beautiful home for a month this winter. We loved our stay here! The house is beautifully appointed, has a wonderful inside/ outside feeling to it and is designed in such a way that there were separate spaces for everyone.Easy hop to the many great restaurants on Abbot Kinney and good walk or bike to the beach. We would definitely stay here again! My wife and our toddler daughter rented Gar and Lisa's house for almost 9 months over 2012/13. It's a fantastic place. Build -- by Gar -- and decorated -- by them both -- with style and passion. I can't recommend it highly enough. Gets wonderful light, manages to be both comfortable and elegant, and the kitchen is stocked with every possible item one could ever need to cook/serve anything. 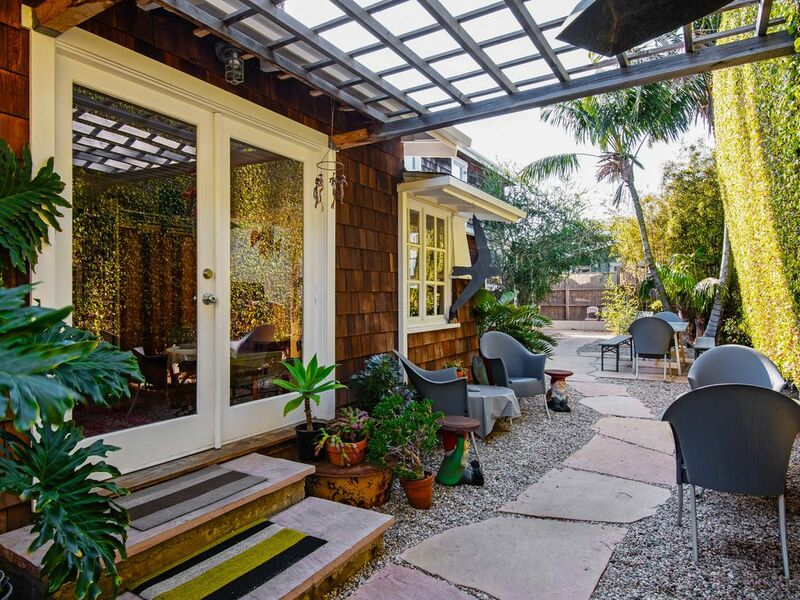 It's located on a perfect little Venice alley, walking distance to nearly everything. We loved it and will always think of our time there with the utmost fondness. Can't do any better in Venice. What a wonderful two weeks we just spent at this exquisitely and tastefully remodeled cottage turned architectural delight in Venice, California. The location is terrific as the home is just a short 1-2 block stroll from Abbot Kinney and all its fabulous shops and restaurants. Ample natural light flows from room to room and when the weather is good, and let's face it, when isn't it, it's a treat to open up all the doors and feel like you're living outdoors! The home is well equipped with all your needs for cooking or grilling. The owner, Garfield is very flexible and accommodating and is the mastermind behind the home's architectural reinvention. While there aren't "toys" or kid activities in the home, it certainly is kid-friendly and my three-year old was never feeling she was missing anything. It's quiet and serene and safe. We met one of the charming neighbors and even if you're a guest for just a few days, it's easy to feel you're at home.